And even more amazingly, did it in just five years. Let's say that five years ago, you invested $8,000 in an S&P 500 index fund. You'd probably be pretty pleased if you checked it today and found about $13,500 in there. On the other hand, if you'd invested in one of these stocks, you'd be sitting on more than $25,000...in one case, a lot more! But what's most interesting about these two stocks is how little the companies have in common, from their age to their size to their location to their industries. It just goes to show that the best outperformers can be found in any sector of the market. So let's take a look at these two amazing growth stories: Tesla (NASDAQ:TSLA) and Cintas (NASDAQ:CTAS). These two top companies have handily outperformed the S&P. Image source: Getty Images. Tesla probably needs no introduction: Elon Musk's electric car, solar panel, and energy storage company has been hyped, trashed, analyzed, and scrutinized all over the news...and that's just in the past week. An investment in Tesla is an investment in Musk's vision of the future. But it's a very compelling vision, that has driven share prices up 214% over the past five years. That means that $8,000 invested in Tesla five years ago would be worth just over $25,000 today. But the company remains a speculative investment. While Musk claims that "it's really looking" like Tesla will post positive GAAP net income in Q2 2018, and positive cash flow in Q3 and Q4, many analysts aren't so sure. The company is still struggling to get up to speed producing the Model 3 sedans on which hundreds of thousands of people have put a $1,000 deposit. The company's longtime goal has been to produce 5,000 Model 3 units per week, but right now, it's only producing about 3,500 per week. Musk says he hopes to achieve the 5,000-per-week target by the end of June. You'll notice how many speculative words there are in that last paragraph. Tesla has grown its infrastructure, its revenue, its share price, and its profile. But its future is uncertain, to say the least. I own shares in Tesla because I'm still hopeful Musk's vision will pan out, and I'm thrilled with how well they've performed. However, I'm not sure I'd buy in now. You might call Cintas many things, but "cool" or "disruptive" probably aren't either of them. Cintas is about the polar opposite of Tesla. Where Tesla has set up shop in hip Palo Alto, California, Cintas has made its home in staid Cincinnati, Ohio. While Tesla was founded in 2003, Cintas got its start back in 1929. And while Tesla has made its fortune in the hot new technologies of electric cars and solar panels, Cintas performs the yawn-inducing services of uniform rental and laundering, and restroom restocking. CTAS Total Return Price data by YCharts. 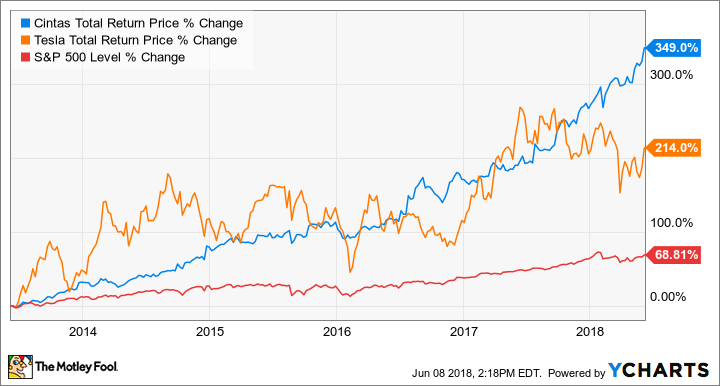 Not only have Cintas' shares outperformed Tesla's by more than 100 percentage points, the company's growth trajectory has been remarkably consistent compared to the ups and downs of Tesla's. While investing in Tesla would have turned your $8,000 into just over $25,000, putting that money in Cintas instead would have turned itinto $35,920 if you reinvested the dividend right back into the stock. While Tesla has tapped into a hot up-and-coming tech market, Cintas has grown the old-fashioned way: Gaining share in an incredibly fractured market, acquiring smaller competitors, and supplementing its core uniform rental business with other compatible business services. Sometimes those new services have paid off for the company, and sometimes they haven't -- like the underperforming document-shredding business Cintas sold to Stericycle in 2015. Cintas is likely to continue to grow. As the economy improves and puts more Americans to work, more of them will need uniforms. And even after Cintas' purchase of major competitor G&K Services last year, the uniform rental market is still fragmented, offering Cintas further opportunities to grow through acquisition. Finally, Cintas' first aid and safety services segment -- which restocks first aid kits, fire extinguishers, and other safety gear -- is growing faster than its core uniform rental business, posting 10% organic growth in the most recent quarter compared to 6.5% organic growth for the rest of the business. Even with more-than-300% growth over the last five years, Cintas seems poised to continue expanding well into the future. The conventional wisdom would tell you that the biggest opportunities for growth are in disruptive businesses, particularly hot companies blazing trails in new technologies. Obviously, that's not entirely off the mark, and Tesla is a prime example of a company that's come a long way in the last half-decade, rewarding its shareholders in the process. But it's a mistake to ignore established -- even boring -- companies and industries when you're looking for growth opportunities. And in fact, not only has Cintas' stock outperformed Tesla's over the last five years, I'd argue it has a clearer path to growth than the headline-grabbing Tesla.